Computer speakers, or multimedia speakers, are speakers external to a computer, that disable the lower fidelity built-in speaker. They often have a low-power internal amplifier. The standard audio connection is a 3.5 mm (approximately 1/8 inch) stereo jack plug often colour-coded lime green (following the PC 99 standard) for computer sound cards. A plug and socket for a two-wire (signal and ground) coaxial cable that is widely used to connect analog audio and video components. Also called a “phono connector,” rows of RCA sockets are found on the backs of stereo amplifier and numerous A/V products. The prong is 1/8″ thick by 5/16″ long. A few use an RCA connector for input. There are also USB speakers which are powered from the 5 volts at 500 milliamps provided by the USB port, allowing about 2.5 watts of output power. 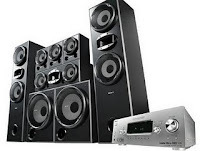 Computer speakers range widely in quality and in price. The computer speakers typically packaged with computer systems are small, plastic, and have mediocre sound quality. Some computer speakers have equalization features such as bass and treble controls. The internal amplifiers require an external power source, usually an AC adapter. More sophisticated computer speakers can have a ‘subwoofer’ unit, to enhance bass output, and these units usually include the power amplifiers both for the bass speaker, and the small ‘satellite’ speakers.